Verdure Sciences — Never heard of this company? Neither had I until I started trying to find a natural botanical compound called Curcumin to help treat Addi and Cassi, our identical twins who suffer from a fatal disease that mimics Alzheimer’s in young children. It’s called Niemann Pick Type C (NP-C) and I learned last October that it’s trying to destroy my twins’ brains and kill them. There is only one experimental drug for Niemann Pick Type C that costs a whopping $160,000 per year so I began looking at every available alternative to treat our twins and save them from dementia. After learning through a special MRI brain scan that Addi and Cassi have brain inflammation I focused my efforts on anti-inflammatory products that get across the blood brain barrier. I had heard about a natural “wonder compound” called Curcumin that was working well in NPC mice studies and also in Alzheimer’s mice studies. Curcumin is not a new idea. It’s a component of Turmeric, an Indian spice, and people have been trying it as therapy for a variety of diseases and there are thousands of scientific papers on its amazing properties. But I found out there was a major problem with Curcumin. The BBB. Curcumin was a “lab superstar” and working well in test tubes but when tested in humans the absorption rate was extremely low. I was told by our doctors that the Curcumin currently available on the market, even pharmaceutical grade, would not cross the blood brain barrier (BBB) to help Addi and Cassi with brain inflammation. I decided I would try and create my own “bio-available” version of Curcumin and started reading everything I could get my hands on. I even arranged for a formulation pharmacy to help me make a Curcumin suspension. It was then that I read about Dr. Greg Cole. Dr. Cole is a leading Alzheimer’s researcher at UCLA and during my research I found out that he is the leading authority on Curcumin and had written dozens of papers on the neuro-protective properties of the substance. I decided to email him to see if he could help me understand the bio-available aspects of Curcumin. A prayer was answered the day I emailed Dr. Cole. His team at UCLA has developed a formulation of “Optimized Curcumin” that works more like a drug with “super bio-availability.” See the chart. UCLA’s Curcumin was not only crossing into the blood stream it was crossing through the blood brain barrier (BBB). The BBB is a membranic structure in the central nervous system (CNS) that restricts the passage of various chemical substances and things like bacteria between the bloodstream and the neural tissue itself, while still allowing the passage of substances like oxygen that is essential to metabolic function. UCLA put me in touch with Verdure Sciences, an innovative bio-nutritional company, making the super bio-available version of Curcumin. UCLA and Verdure Sciences have done extensive testing and spent several years creating this special formulation. I immediately put Addi and Cassi on significant doses of Curcumin and noticed improvements in their mood, balance and coordination right away. While this is anecdotal, I cannot attribute these positive effects in my girls to anything other than Verdure Sciences optimized Curcumin formulation. Except for a modest amount of diarrhea when we initially started the girls on it, there are no negative side effects from what I can tell. It’s all natural and not even a drug yet it’s acting like a powerful anti-inflammatory. Do not be fooled by what other companies claim with their Curcumin products. If they tell you it’s optimized Curcumin, it’s not! There are lots of Internet scams and companies that make all kids of false claims. 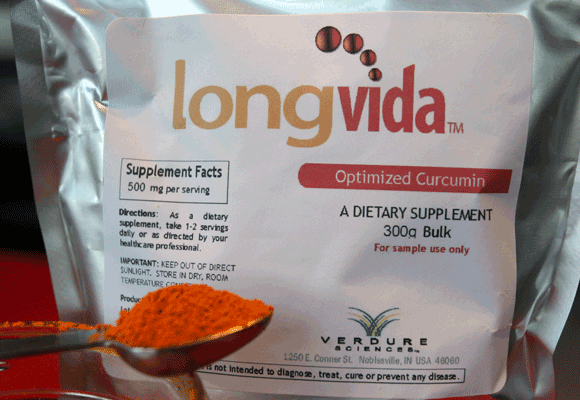 Verdure Sciences is the only company that has the optimized Curcumin with UCLA mice studies to back it up. The product is going to be marketed under the name LongVida or “Long Life” but right now it’s only available if you call them directly. One of the real neuro-protective compounds for the 21st century has finally arrived and it’s not even made by a pharmaceutical company. Thank you UCLA and Verdure Sciences for persevering to bring theraputic Curcumin to people. While the drug companies are only interested in “drugs” and financial profits, you have shown us a new pathway with Curcumin that is not all about money — it’s truly about health and trying to save peoples lives. I will be forever grateful and I know others will be too.